How do you react to when the stock market is down or it gets bumpy? Do any of these sound familiar? Every one of these things is extremely detrimental to our financial health. 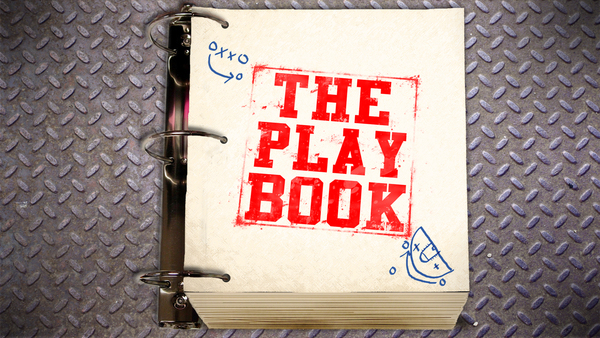 Nothing kills the long-term returns of a portfolio like throwing away the playbook in the heat of a market crisis. 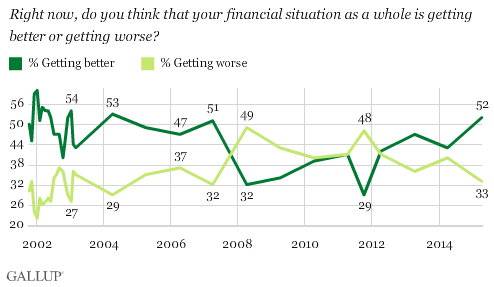 A majority of Americans, 52%, say their financial situation is “getting better,” the highest percentage to say this since 2004. It is also the first time since the recession that this sentiment has reached the majority level. These data are from a Gallup’s annual Economy and Finance survey, poll conducted April 9-12. The percentage of Americans saying their situation is getting better rose nine percentage points from last year. 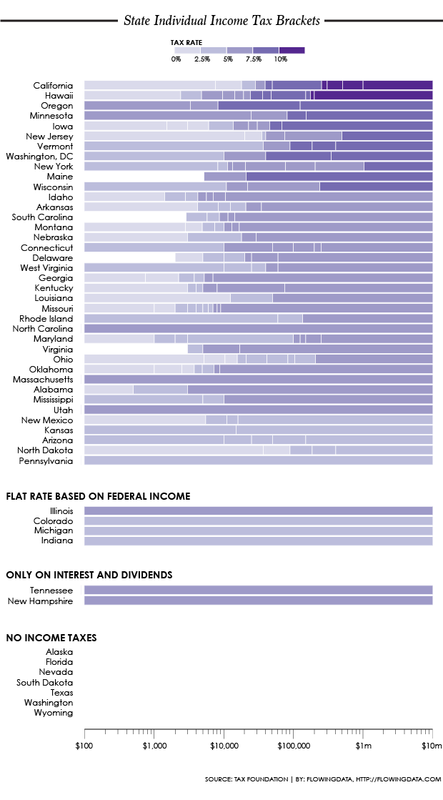 You probably finished your taxes months ago, but here’s a chart of the tax brackets and rates in all the states in case you’re interested. Each segment represents a bracket, and the darker the shade the higher the rate. Organization. We will help bring order to your financial life, by assisting you in getting your financial house in order (at both the “macro” level of investments, insurance, estate, taxes, etc., and also the “micro” level of household cash flow). Accountability. 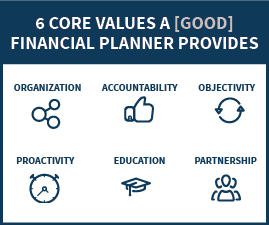 We will help you follow through on financial commitments, by working with you to prioritize your goals, show you the steps you need to take, and regularly review your progress towards achieving them. Objectivity. We bring insight from the outside to help you avoid emotionally driven decisions in important money matters, by being available to consult with you at key moments of decision-making, doing the research necessary to ensure you have all the information, and managing and disclosing any of our own potential conflicts of interest. Proactivity. We work with you to anticipate your life transitions and to be financially prepared for them, by regularly assessing any potential life transitions that might be coming, and creating the action plan necessary to address and manage them ahead of time. Education. We will explore what specific knowledge will be needed to succeed in your situation, by first thoroughly understanding your situation, then providing the necessary resources to facilitate your decisions, and explaining the options and risks associated with each choice. Partnership. We attempt to help you achieve the best life possible but will work in concert with you, not just for you, to make this possible, by taking the time to clearly understand your background, philosophy, needs and objectives, work collaboratively with you and on your behalf (with your permission), and offer transparency around our own costs and compensation. 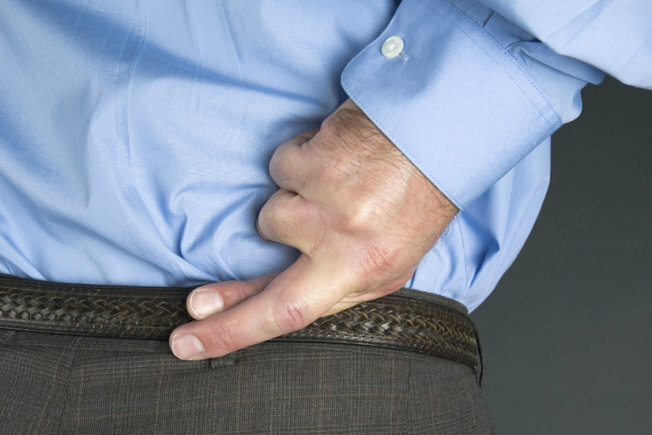 A report released last week by the Public Investors Arbitration Bar Association (PIABA) pointed out nine big brokerages for advertising as if they are fiduciaries, but denying that standard and renouncing any requirement to avoid conflicted advice in private arbitration hearings. Those nine brokerages are: Merrill Lynch, Fidelity Investments, Ameriprise, Wells Fargo, Morgan Stanley, Allstate, UBS, Berthel Fisher, and Charles Schwab. Fiduciaries have a legal requirement to put client interests ahead of all others. The report includes samples of misleading advertising from major brokerage firms AND the firms’ legal repudiations when their brokers are sued for losses caused by misconduct.